in which the supply of a single nutrient controls growth rate. The fermenter is called a chemostat because the growth rate is controlled by the availability of a single component of the medium (the limiting substrate). Important features are that it is the continuous introduction of fresh medium that feeds the limiting substrate to the culture and the dilution rate (that is, the rate of addition of fresh medium) determines the specific growth rate of the culture (Fig. 24) (Matteau et al., 2015). Fig. 24. A basic chemostat. A, Sketch diagram of a continuous culture vessel. B, Record of biomass concentration (x) and substrate (glucose) concentration (S) over the early stages of a cultivation showing the transition from the initial batch phase to the continuous culture phase. Substrate-limited growth can be maintained indefinitely and this can offer relief of catabolic repression and induction of secondary metabolism at low substrate (glucose) concentration. When chemostat cultures are operated for a very long time the organism evolves (see below); indeed, chemostat cultures can be used to select mutants with particular physiological characteristics (see Table 7). where D = dilution rate, F = medium flow rate, V = culture volume. Thus, if F = 1 litre h-1 and V = 5 litres, then D = 0.2 h-1. At steady state µ = D. Thus, µ can be varied in a chemostat from just above 0 to just below µmax. At steady state, the biomass concentration and limiting substrate concentration in the culture remain constant (Fig. 24B). And that link between limiting substrate concentration and biomass concentration is why the rig is called a chemostat. where bar-x = biomass concentration in the fermenter vessel, bar-s = concentration of growth limiting substrate in the fermenter vessel, Y = yield coefficient for the limiting substrate (Y is about 0.5 for glucose), sr = concentration of growth limiting substrate in the inflowing medium. The effect of dilution rate on biomass concentration and limiting substrate (glucose) concentration is illustrated in Fig 25, which shows two scenarios in which the concentrations of glucose in the medium entering the chemostat is either 1.0 or 0.2 g l-1. As the culture approaches µmax (1.0 h-1) biomass is washed out of the vessel and residual glucose concentration increases. The mean residence time of the organism in fermenter vessels is the reciprocal of the dilution rate (that is, R = 1/D, where R = mean residence time of the organism and D = dilution rate). Fig. 25. The effect of dilution rate on biomass concentration and limiting substrate (glucose) concentration. As the culture approaches µmax (1.0 h-1) biomass is washed out of the vessel and residual glucose concentration increases. There are two main types of continuous flow cultures, turbidostats and chcmostats (Table 7). Both must be perfectly mixed suspensions of biomass to which the medium is fed at a constant rate and culture is harvested at the same rate. In the chemostat the specific growth rate is controlled externally by the concentration of a single nutrient, the limiting-substrate. In a glucose-limited chemostat, almost all the glucose is utilised by the culture with the result that biomass concentration reaches a constant value which is essentially proportional to the glucose concentration in the inflowing medium (this is the steady state). 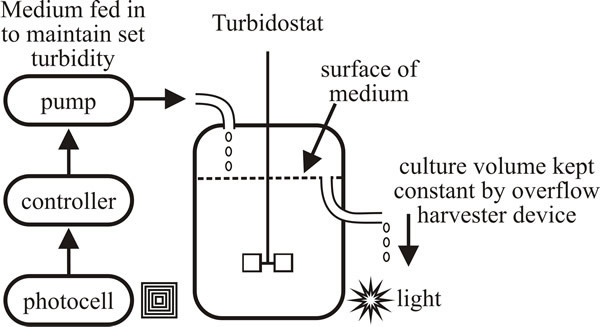 The specific growth rate of a turbidostat culture is at or very close to µmax and is controlled by the rates of internal cellular reactions as they are expressed in the optical density of the culture biomass (that is, the turbidity of the culture). This is done by photometers in which incident light is scattered by the culture and the transmitted light is detected and measured by the photometer; when turbidity (that is, transmitted light detected) reaches a certain level, a medium pump is switched on to return the turbidity to the required level (Fig. 26). The aim is to hold culture turbidity constant by manipulating the rate at which medium is fed. If the turbidity tends to increase, the feed rate is increased to dilute the turbidity back to its set point. When the turbidity tends to fall, the feed rate is lowered so that growth can restore the turbidity to its set point. The optical surfaces of the detectors most often used to measure turbidity are easily fouled by growth of microbial biofilms, foam or precipitates from the medium and the problems presented by this fouling have not been solved. In practice, a turbidostat operates well for a brief period, but the control of the turbidity eventually becomes unreliable. In a culture controlled this way, increasing nutrient concentration will affect biomass concentration but not specific growth rate. As shown above, the biomass concentration in the fermenter vessel at steady state is given by bar-x = Y (sr – bar-s). Fig. 26. Schematic of a turbidostat. Photocells measure the light transmitted through the turbid culture; when turbidity (that is, transmitted light detected) reaches a certain level, a medium pump is switched on to return the turbidity to the required level. If turbidostats can be maintained for long periods, the system will apply selection pressure for mutants with increased µmax values. Turbidostats have also been used to select mutants with increased resistance to an antibiotic. dielectric permittivity (permittivity is of the ability of a material to transmit (‘permit’) an electric field), which is affected by changes in the culture as it grows and is measured with a radio-based sensor that controls addition of medium (such chemostats are called permittistats).